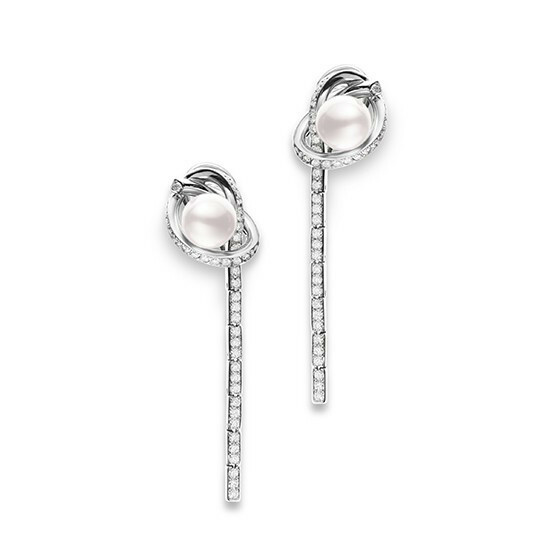 These modern, luxurious earrings from Mikimoto are part of the designer's Kaguwashi collection. Crafted in 18kt white gold, they're a new interpretation of a traditional motif. While bearing the look of a classic love knot, a gorgeous Akoya pearl nests within the loop, and there's an added twist, thanks to the continuing line of brilliant diamonds cascading down. These Mikimoto earrings present an unparalleled update for today's sophisticated woman.